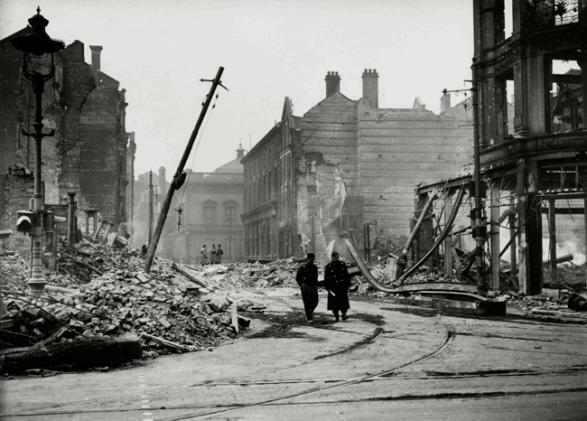 The Belfast Blitz was four attacks of high-casualty German air raids on strategic targets in the city of Belfast in Northern island . in April and May 1941 during World War II. The first was on the night of 7–8 April 1941, a small attack which probably took place only to test Belfast’s defences. The next took place on Easter Tuesday , 15 April 1941. Two hundred bombers of the Luftwaffe attacked military and manufacturing targets in the city of Belfast. Some 900 people died as a result of the bombing and 1,500 were injured. High explosive bombs predominated in this raid. Apart from those on London, this was the greatest loss of life in any night raid during the Blitz. As the UK was preparing for the conflict, the factories and shipyards of Belfast were gearing up. Belfast made a considerable contribution towards the Allied war effort, producing many naval ships, aircraft and munitions; therefore, the city was deemed a suitable bombing target by the Luftwaffe. Meanwhile, unlike Northern Ireland, southern Ireland was no longer part of the UK. Under the leadership of Éamon de Valera, it had declared its neutrality during the Second World War. Although it arrested German spies that its police and military intelligence services caught, the state never broke off diplomatic relations with Axis nations: the German Legation in Dublin remained open throughout the war. Craigavon died on 24 November 1940. He was succeeded by John Miller Andrews, then 70 years old, who was no more capable of dealing with the situation than his predecessor. On 28 April 1943, six members of the Government threatened to resign, forcing him from office. He was replaced by Sir Basil Brooke on 1 May. Harland and Wolff was one of the largest shipbuilding yards in the world. It had constructed many ships for the Royal Navy, including aircraft carriers such as HMS Formidable and Unicorn; the cruisers, HMS Belfast and Penelope as well as 131 other naval vessels. Up to 35,000 people were employed. During the war years, Belfast shipyards built or converted over 3,000 navy vessels, repaired more than 22,000 others and launched over half a million tons of merchant shipping – over 140 merchantmen. Aero linen for covering aircraft, such as the Hawker Hurricane, and military glider frames was manufactured by a number of Belfast flax spinning mills, such as The York Street Flax Spinning Co.; Brookfield Spinning Co.; Wm. Ewart’s Rosebank Weaving Co.; and the Linen Thread Co.
War materials and food were sent by sea from Belfast to Britain, some under the protection of the neutral Irish tricolour. The M.V. Munster, for example, operated by the Belfast Steamship Company, plied between Belfast and Liverpool under the tricolour, until she hit a mine and was sunk outside Liverpool. Sir James Craig, former Prime Minister of Northern Ireland. Dawson Bates, the Home Affairs Minister, simply refused to reply to army correspondence and when the Ministry of Home Affairs was informed by imperial defence experts that Belfast was a certain Luftwaffe target, nothing was done. Belfast, the city with the highest population density had the lowest proportion of air-raid shelters. Prior to the “Belfast Blitz” there were only 200 public shelters, although 4,000 households had built their own shelters. No searchlights were set up, as they had only arrived on 10 April. There were no night-fighters. On the night of the raid, no Royal Air Force (RAF) aircraft took to the air. There were only 22 anti-aircraft guns, six light, and sixteen heavy. On the night, only seven were operated for a short time. There was no smokescreen ability. There were some barrage balloons. These air-raid shelters were Anderson shelters. They were sheets of corrugated galvanised iron covered in earth. Since most casualties were caused by falling masonry rather than by blast, they provided effective shelter for those who had them. Few children had been successfully evacuated. The “Hiram Plan” initiated by Dawson Bates, the Home Affairs Minister, had failed to materialise. Fewer than 4,000 women and children were evacuated. There were still 80,000 more in Belfast. Even the children of soldiers had not been evacuated, with calamitous results when the married quarters of Victoria Barracks received a direct hit. There had been a number of small bombings, probably by planes that missed their targets over the River Clyde in Glasgow or the cities of the northwest of England. On 24 March 1941, John MacDermott, Minister for Security, wrote to Prime Minister John Andrews, expressing his concerns that Belfast was so poorly protected: “Up to now we have escaped attack. So had Clydeside until recently. Clydeside got its blitz during the period of the last moon. There [is] ground for thinking that the … enemy could not easily reach Belfast in force except during a period of moonlight. The period of the next moon from say the 7th to the 16th of April may well bring our turn.” MacDermott would be proved right. The first deliberate raid took place on the night of 7 April. (Some authors count this as the second raid of four). It targeted the docks. Neighbouring residential areas were also hit. Six Heinkel He 111 bombers, from Kampfgruppe 26, flying at 7,000 feet (2,100 m), dropped incendiaries, high explosive and parachute-mines. By British mainland blitz standards, casualties were light. Thirteen lost their lives, including a soldier killed when an anti-aircraft gun, at the Balmoral show-grounds, misfired. The most significant loss was a 4.5-acre (1.8 ha) factory floor for manufacturing the fuselages of Short Stirling bombers. The Royal Air Force announced that Squadron Leader J.W.C. Simpson shot down one of the Heinkels over Downpatrick. The Luftwaffe crews returned to their base in Northern France and reported that Belfast’s defences were, “inferior in quality, scanty and insufficient”. William Joyce (known as “Lord Haw-Haw“) announced in radio broadcasts from Hamburg that there will be “Easter eggs for Belfast”. That evening up to 200 bombers left their bases in northern France and the Netherlands and headed for Belfast. There were Heinkel He 111s, Junkers Ju 88s and Dorniers. At 10:40 pm the air raid sirens sounded. Accounts differ as to when flares were dropped to light up the city. The first attack was against the city’s waterworks, which had been attacked in the previous raid. High explosives were dropped. Initially it was thought that the Germans had mistaken this reservoir for the harbour and shipyards, where many ships, including HMS Ark Royal were being repaired. However that attack was not an error. Three vessels nearing completion at Harland and Wolff’s were hit as was its power station. Wave after wave of bombers dropped their incendiaries, high explosives and land-mines. When incendiaries were dropped, the city burned as water pressure was too low for effective firefighting. Fifty-five thousand houses were damaged leaving 100,000 temporarily homeless. Outside of London, with some 900 dead, this was the greatest loss of life in a night raid during the Blitz. A stray bomber attacked Derry, killing 15. Another attacked Bangor, killing five. By 4 am the entire city seemed to be in flames. At 4.15am John MacDermott, the Minister of Public Security, managed to contact Basil Brooke (then Agriculture Minister), seeking permission to seek help from the Irish government. Brooke noted in his diary “I gave him authority as it is obviously a question of expediency”. Since 1.45am all telephones had been cut. Fortunately, the railway telegraphy link between Belfast and Dublin was still operational. The telegram was sent at 4.35am, asking the Irish Taoiseach, Éamon de Valera for assistance. and Major Seán O’Sullivan, who produced a detailed report for the Dublin government. There are other diarists and narratives. Brian Barton of Queen’s University, Belfast, has written most on this topic. There is an eye-witness account from John Potter online. The mortuary services had emergency plans to deal with only 200 bodies. 150 corpses remained in the Falls Road baths for three days before they were buried in a mass grave, with 123 still unidentified. Two hundred and fifty-five corpses were laid out in St George’s Market. Many bodies and body parts could not be identified. Mass graves for the unclaimed bodies were dug in the Milltown and City Cemeteries. (Great War casualties) had died in hospital beds, their eyes had been reverently closed, their hands crossed to their breasts. Death had to a certain extent been … made decent. It was solemn, tragic, dignified, but here it was grotesque, repulsive, horrible. No attendant nurse had soothed the last moments of these victims; no gentle reverent hand had closed their eyes or crossed their hands. With tangled hair, staring eyes, clutching hands, contorted limbs, their grey-green faces covered with dust, they lay, bundled into the coffins, half-shrouded in rugs or blankets, or an occasional sheet, still wearing their dirty, torn twisted garments. Death should be dignified, peaceful; Hitler had made even death grotesque. I felt outraged, I should have felt sympathy, grief, but instead feelings of revulsion and disgust assailed me. In his opinion, the greatest want was the lack of hospital facilities. He went to the Mater Hospital at 2 pm, nine hours after the raid ended, to find the street with a traffic jam of ambulances waiting to admit their casualties. He spoke with Professor Flynn, (Theodore Thomson Flynn, an Australian based at the Mater Hospital and father of actor Errol Flynn), head of the casualty service for the city, who told him of “casualties due to shock, blast and secondary missiles, such as glass, stones, pieces of piping, etc.” O’Sullivan reported: “There were many terrible mutilations among both living and dead – heads crushed, ghastly abdominal and face wounds, penetration by beams, mangled and crushed limbs etc.”. His report concluded with: “a second Belfast would be too horrible to contemplate”. Two hundred and twenty thousand people fled from the city. Many “arrived in Fermanagh having nothing with them only night shirts”. Ten thousand “officially” crossed the border. Over 500 received care from the Irish Red Cross in Dublin. The town of Dromara saw its population increase from 500 to 2,500. In Newtownards, Bangor, Larne, Carrickfergus, Lisburn and Antrim many thousands of Belfast citizens took refuge either with friends or strangers. continuous trek to railway stations. The refugees looked dazed and horror stricken and many had neglected to bring more than a few belongings… Any and every means of exit from the city was availed of and the final destination appeared to be a matter of indifference. Train after train and bus after bus were filled with those next in line. At nightfall the Northern Counties Station was packed from platform gates to entrance gates and still refugees were coming along in a steady stream from the surrounding streets … Open military lorries were finally put into service and even expectant mothers and mothers with young children were put into these in the rather heavy drizzle that lasted throughout the evening. On the 17th I heard that hundreds who either could not get away or could not leave for other reasons simply went out into the fields and remained in the open all night with whatever they could take in the way of covering. Dawson Bates informed the Cabinet of rack-renting of barns, and over thirty people per house in some areas. Frank Aiken, the Irish Minister for the Co-ordination of Defensive Measures was in Boston, Massachusetts at the time. He gave an interview saying: “the people of Belfast are Irish people too”. Initial German radio broadcasts celebrated the raid. A Luftwaffe pilot gave this description “We were in exceptional good humour knowing that we were going for a new target, one of England’s last hiding places. Wherever Churchill is hiding his war material we will go … Belfast is as worthy a target as Coventry, Birmingham, Bristol or Glasgow.” William Joyce “Lord Haw-Haw” announced that “The Führer will give you time to bury your dead before the next attack … Tuesday was only a sample.” However Belfast was not mentioned again by the Nazis. After the war, instructions from Joseph Goebbels were discovered ordering it not to be mentioned. It would appear that Adolf Hitler, in view of de Valera’s negative reaction, was concerned that de Valera and Irish American politicians might encourage the United States to enter the war. Eduard Hempel, the German Minister to Ireland, visited the Irish Ministry for External Affairs to offer sympathy and attempt an explanation. J.P. Walshe, assistant secretary, recorded that Hempel was “clearly distressed by the news of the severe raid on Belfast and especially of the number of civilian casualties.” He stated that “he would once more tell his government how he felt about the matter and he would ask them to confine the operations to military objectives as far as it was humanly possible. He believed that this was being done already but it was inevitable that a certain number of civilian lives should be lost in the course of heavy bombing from the air”. 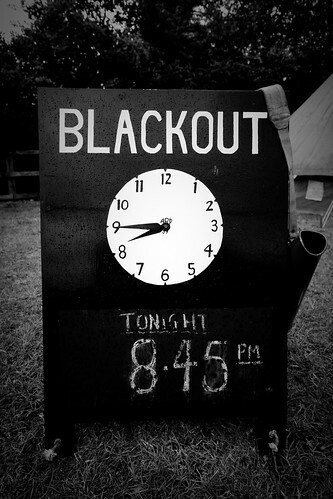 At night Dublin was the only city without a blackout between New York and Moscow, and between Lisbon and Sweden; German bombers often flew overhead to check their bearings using its lights, angering the British. One widespread criticism was that the Germans located Belfast by heading for Dublin and following the railway lines north. In The Blitz: Belfast in the War Years, Brian Barton wrote: “Government Ministers felt with justification, that the Germans were able to use the unblacked out lights in the south to guide them to their targets in the North.” Barton insisted that Belfast was “too far north” to use radio guidance. Other writers, such as Tony Gray in The Lost Years state that the Germans did follow their radio guidance beams. Several accounts point out that Belfast, standing at the end of the long inlet of Belfast Lough, would be easily located. Another claim was that the Catholic population in general and the IRA in particular guided the bombers. Barton wrote: “the Catholic population was much more strongly opposed to conscription, was inclined to sympathise with Germany”, “…there were suspicions that the Germans were assisted in identifying targets, held by the Unionist population.” This view was probably influenced by the decision of the IRA Army Council to support Germany. However they were not in a position to communicate with the Germans, and information recovered from Germany after the war showed that the planning of the blitz was based entirely on German aerial reconnaissance. After three days, sometime after 6pm, the fire crews from south of the border began taking up their hoses and ladders to head for home. By then most of the major fires were under control and the firemen from Clydeside and other British cities were arriving. Some had received food, others were famished. All were exhausted. Two of the crews received refreshments in Banbridge; others were entertained in the Ancient Order of Hibernians hall in Newry. In 1995 on the fiftieth anniversary of the ending of the Second World War an invitation was received by the Dublin Fire Brigade for any survivors of that time to attend a function at Hillsborough Castle and meet Prince Charles. Only four were known still to be alive; one, Tom Coleman, attended to receive recognition for his colleagues’ solidarity at such a critical time. There was a second massive air raid on Belfast on Sunday 4–5 May 1941, three weeks after that of Easter Tuesday. Around 1am, Luftwaffe bombers flew over the city, concentrating their attack on the Harbour Estate and Queen’s Island. Nearby residential areas in east Belfast were also hit when “203 metric tonnes of high explosive bombs, 80 land mines attached to parachutes, and 800 firebomb canisters containing 96,000 incendiary bombs” were dropped. Over 150 people lost their lives in what became known as the ‘Fire Blitz’. Casualties were lower than at Easter, partly because the sirens had sounded at 11.45 pm while the Luftwaffe attacked more cautiously from a greater height. St George’s Church in High Street was damaged by fire. Again the Irish emergency services crossed the border, this time without waiting for an invitation. 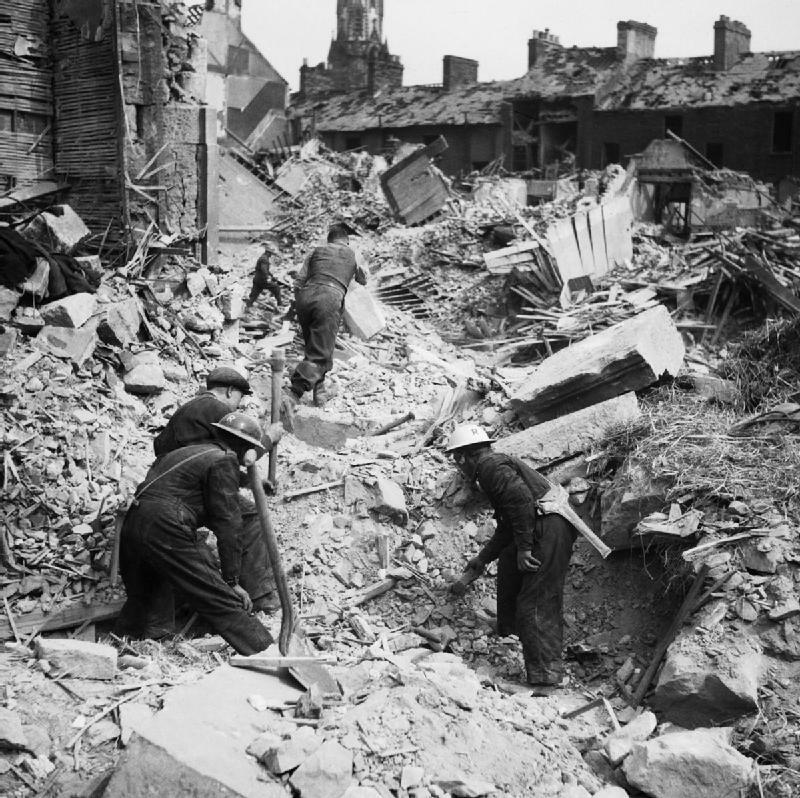 On 31 May 1941, German bombers attacked neutral Dublin in error.